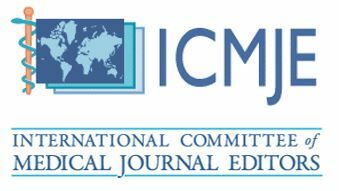 The Stomatology Edu Journal (Stoma Edu J) endorses the Helsinki Declaration and the guidelines of the International Committee of Medical Journal Editors. Studies involving human participants must be performed in accordance with relevant institutional and national guidelines, with the appropriate institutional ethics committee’s approval and informed written consent from all human subjects involved in the study, including the World Medical Association Declaration of Helsinki (version, 2002) and the guidelines of the International Committee of Medical Journal Editors (see here). For manuscripts reporting studies involving human subjects, authors must clearly state the relevant ethics committee approving the study and confirm that study subjects have granted their written informed consent. Manuscripts reporting clinical trial data need to include the name of the public registry under which the clinical trial has been registered, and the number of the trial. For most article types, the information should appear in the Materials and Methods section. For example: This study was carried out in accordance with the recommendations of ‘name of guidelines, name of committee’ with written informed consent from all subjects. All subjects gave written informed consent in accordance with the Declaration of Helsinki. Should the study be exempt from this requirement, authors need to clearly state the reasons in the cover letter and manuscript. For incompetent patients (e.g., young children, unconscious patients) some form of consent, such as from family members, is needed. When experimental animals are used the methods section must clearly indicate that adequate measures were taken to minimize pain or discomfort. Experiments should be carried out in accordance with the Guidelines laid down by the National Institute of Health (NIH) in the USA regarding the care and use of animals for experimental procedures or with the European Communities Council Directive of 24 November 1986 (86/609/EEC) and in accordance with national guidelines and regulations. In the manuscript, authors must identify the full name of the ethics committee that approved the work. For most article types, this statement should appear in the Materials and Methods section. For example: This study was carried out in accordance with the recommendations of ‘name of guidelines, name of committee’. The protocol was approved by the ‘name of committee’. 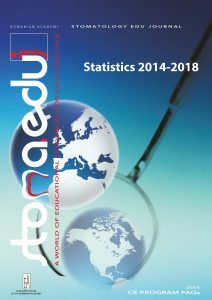 Citations, tables, figures etc. which are not original must be accompanied by the written permission for their use and the full reference must be provided. Should the study be exempt from this requirement, authors need to clearly state the reasons in the cover letter and manuscript. Photographs of identifiable persons must be sent alongside the written permission of the person(s) and all regions that may allow the identification of the subject must be covered. 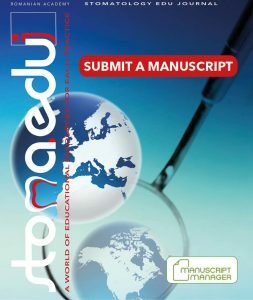 The author must have obtained, for all studies including human subjects, the permission of the subjects to be part of the study whilst keeping their anonymity. 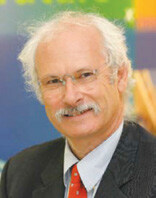 By sending the article, the author declares that he obtained this permission from all his subjects. 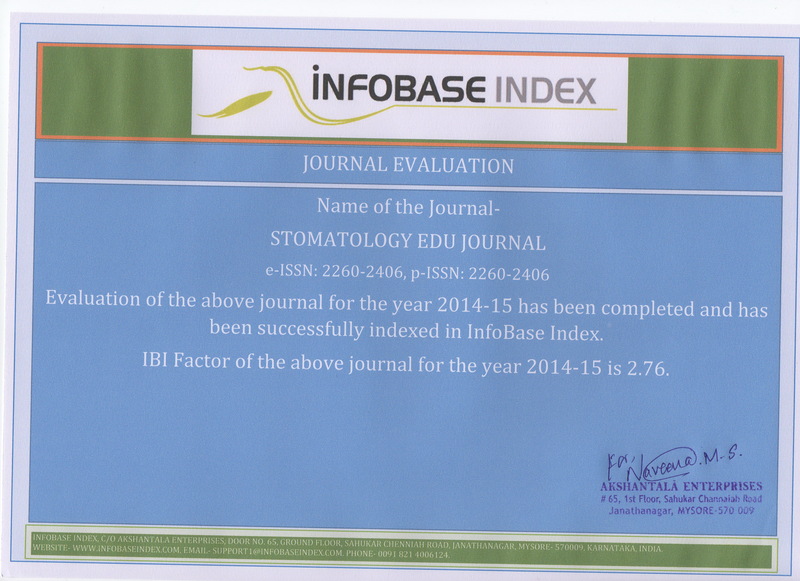 The Stomatology Edu Journal (Stoma Edu J) requires that all studies that involve human subjects or participants be approved or deemed exempt by an official institutional review board or ethics review board as applicable in the authors’ country. Information about ethical approvable must be clearly stated in the Methodology section of the manuscript before submission. The Value of Consensus Conferences: Peer review by 50 key opinion leaders! 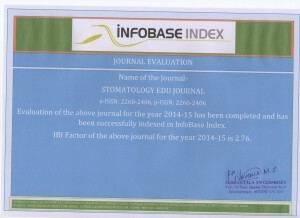 All articles published by STOMATOLOGY EDU JOURNAL (Stoma Edu J) applies the Creative Commons Attribution Non Commercial (CC BY-NC 4.0) license, which permits others to distribute, remix, adapt, build upon this work non-commercially, and license their derivative works on different terms, provided the original work is properly cited and the use is non-commercial.